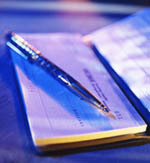 A non-dividend bearing account which offers all of the conveniences of a checking account with no monthly fee. Minimum Balance to Open Account - An opening balance of $25.00 is required. Dividends - This account does not pay dividends. A dividend bearing checking account which is designed to reward members who maintain higher balances while providing convenience to their funds. No minimum balance fee if you maintain a $1,000.00 minimum daily balance. Minimum Initial Balance to Open Account - An opening balance of $25.00 is required. Rate Information - The dividend rate and annual percentage yield may change every dividend period. We may change the dividend rate for your account as determined by the Board of Directors. Call any of our Member Service Representatives to obtain current rate information or check this website.